The Darke County Veterans Service Commission is a five member board appointed under the provisions of Title 59 of the Ohio Revised Code. Each member is appointed by the Judge of the Court of Common Pleas of Darke County for a term of five years. Each is appointed to represent a specific veteran’s organization in our county, current commissioners represent The American Legion, DAV, Veterans of Foreign Wars, and one at large member. Even though their appointment is from a specific organization, they represent all Darke County Veterans and their families. 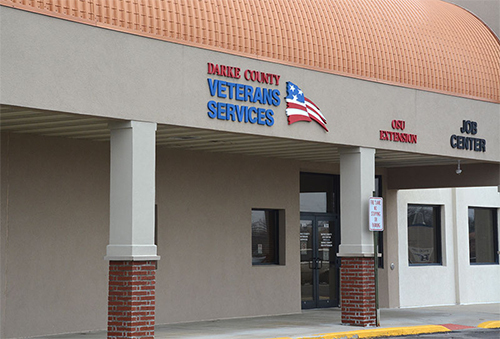 The Commisison oversees the operation of the Darke County Veterans Service Office, and is responsible to ensure that veterans and their eligible family members receive all benefits – federal, state, and local – to which they may be entitled. James served in the US Air Force from 1966 to 1970 and is a Vietnam veteran. He has served on the commission since July 2013. James served in the US Navy from January to October 1972 and is a Vietnam era veteran. He has served on the commission since January 2015. Philip served in the US Army over 30 years. He retired in 2008 as a First Sergeant. He has served on the commission since January 2017. Gaylen served in the US Army from 1968 to 1970. He is a Vietnam veteran. He has served on the commission since January 2019. Jack served in the US Army from 1967 to 1973 and is a Vietnam era veteran. He has served on the commission since October, 2011. Tom served in the US Air Force from 1986 to 2010. He retired as a Senior Master Sergeant. Tom has been on the staff since July 2013. Var served in the US Air Force from 2008 to 2013. He has been on the staff since July 2013. Krisann is the daughter of a US Army Veteran. She has been on the staff since April 2007. Cindy is the wife of a US Army Veteran. She has been on the staff since January 2007. Jack served in the US Marine Corps from January to August 1992. He has been on the staff since January 2008. © Darke County Veterans Services. A Doss Business Systems Design.